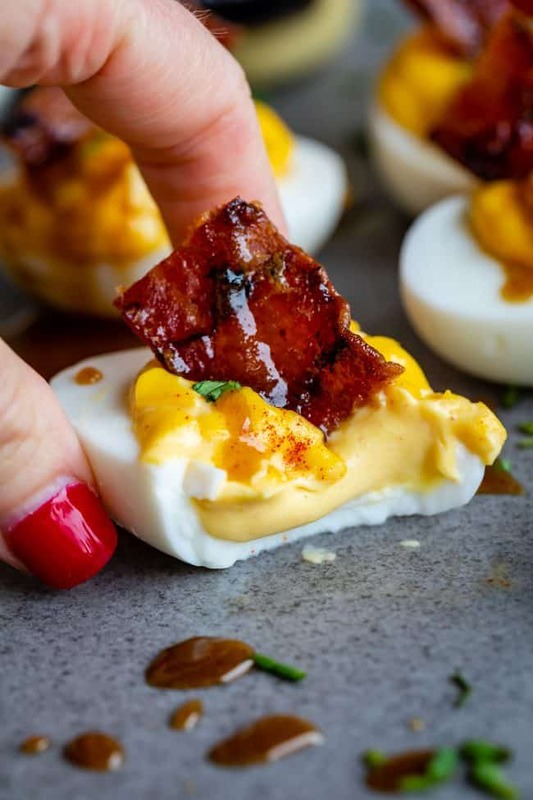 There are deviled eggs…and then there are Dijon Deviled Eggs with Maple Candied Bacon! I mean come on. 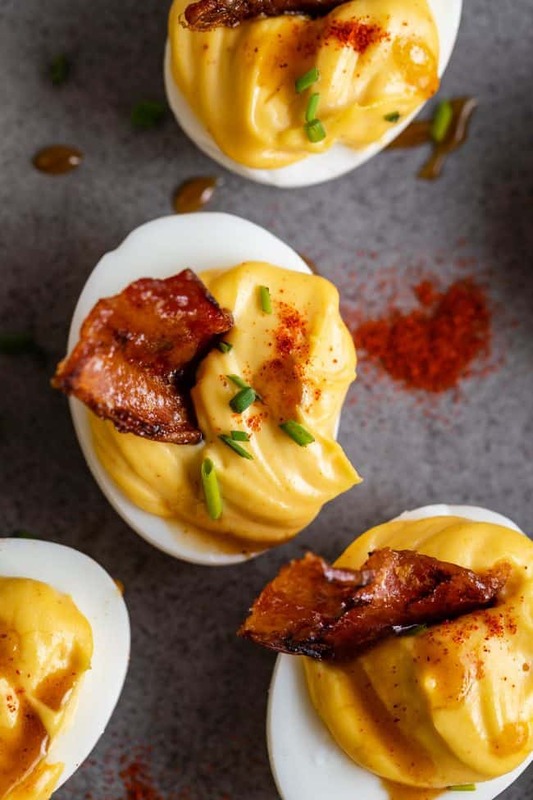 Deviled eggs are already everyone’s favorite appetizer, and using dijon and adding candied bacon just puts it over the top. Plus I will teach you the best way to make hard boiled eggs that are perfectly tender and SO easy to peel. This post is sponsored by Mirum, but all opinions are my own of course! Thanks for supporting the amazing brands that keep The Food Charlatan chugging along. My 5-year-old son Truman did something naughty the other day, and I told him to watch it or I would send him to bed early. Then he, cool calm and collected, told me that that’s a silly thing to threaten him with. Going to bed early makes him happy, he said, because it means he can get some more sleep in. Well OKAY I’ll just throw that disciplining technique out the window then. Seriously, how did I get such an old man for a 5 year old?? I wish I had his mentality about sleep. I’m always trying to stay up too late. We’ll sleep when we’re dead, right?? Let me introduce you to your new favorite appetizer! 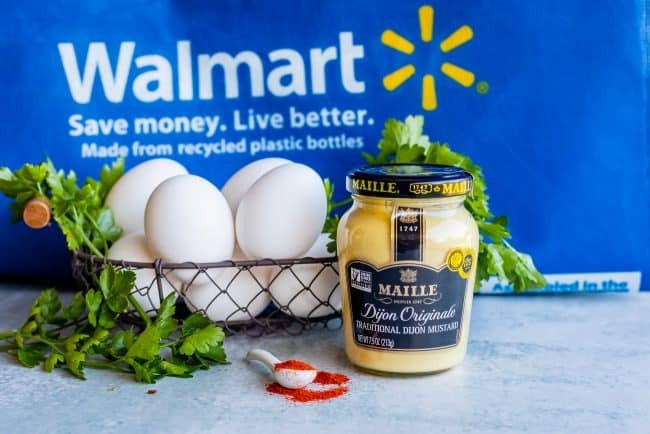 I’m working with Maille® Dijon Originale (pronounced “MY” mustard) to bring you this amazing recipe for dijon deviled eggs with bacon. And not just any bacon, candied maple and dijon bacon! I picked up everything I needed for this recipe at Walmart. They have such amazing selection, and it’s so nice to be able to grab everything I need in one trip. They also have a grocery pick up option. I am all over this idea, sometimes dragging the kids to one more store is just not gonna happen! 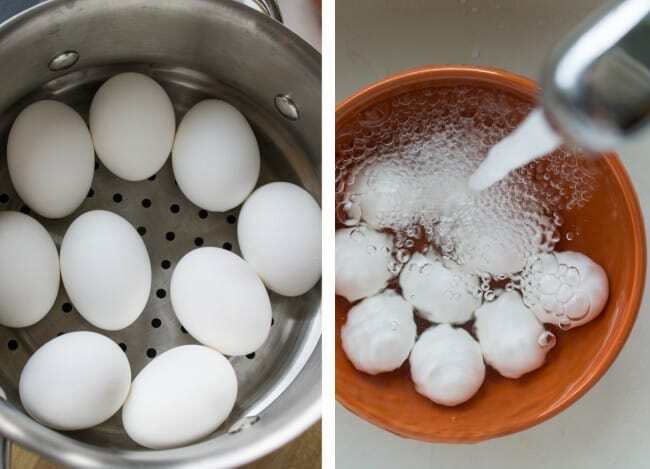 How do you like to make hard boiled eggs? I always steam my eggs in a simple steaming basket. I find that it makes the eggs SO easy to peel. 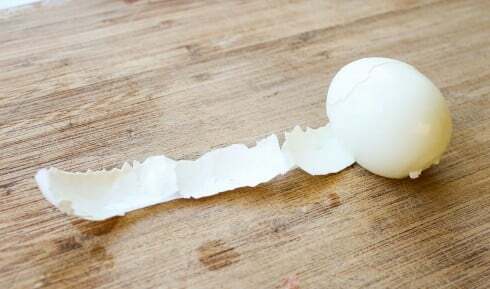 How many boiled eggs have you ruined by peeling half the egg white off with the shell? It’s so sad. That never happens when you steam. If you don’t have a steaming basket, instructions for regular hard boiling are below. And this demonstrates how easy they are to peel. No more sad torn up egg whites! 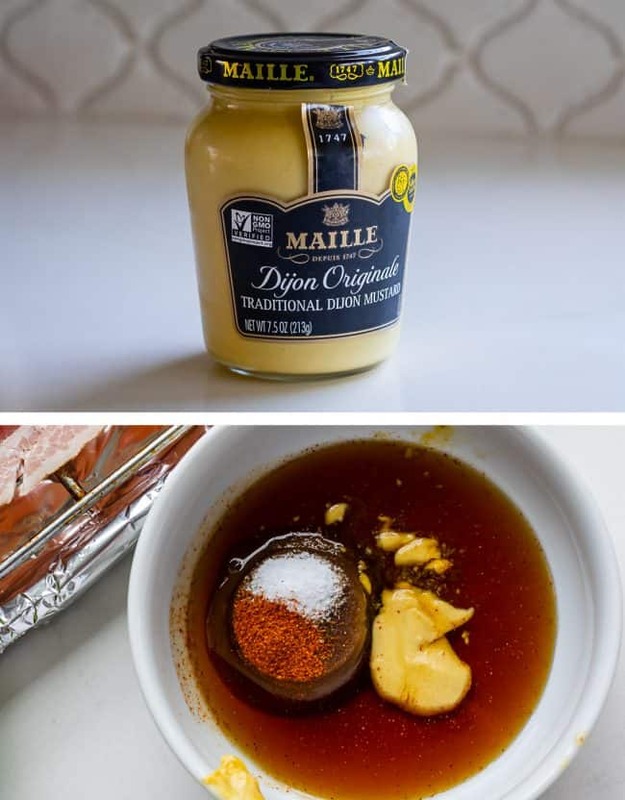 Once you’ve got your eggs nicely steamed or boiled, remove all the yolks and smash it together with some mayonnaise, a few spices, and Maille Dijon Originale. 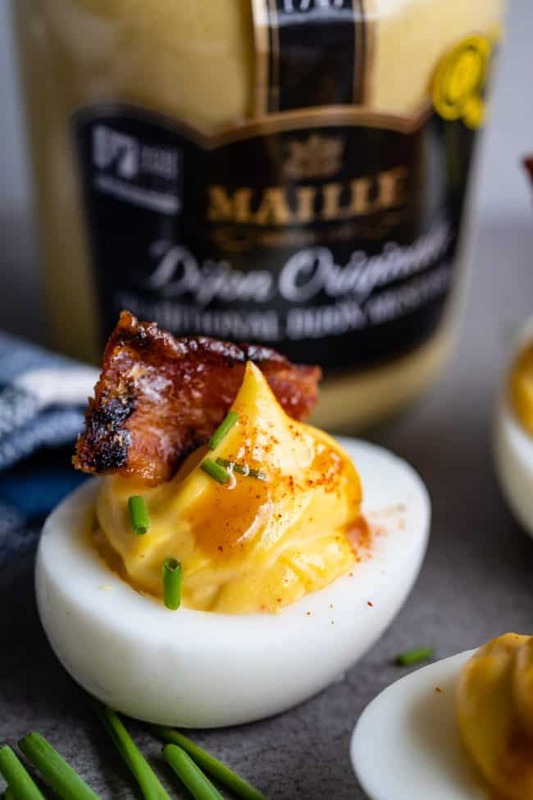 Maille Dijon is the perfect way to take your deviled eggs to the next level! 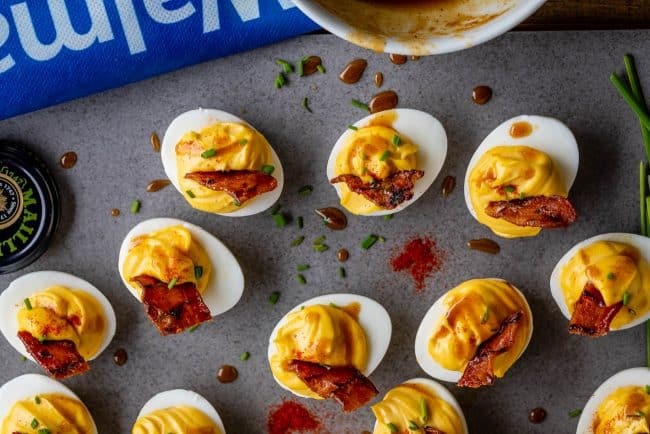 It just has that perfect oomph that you need for these deviled eggs with bacon. First you slap some bacon on a cooling rack and let some of the grease bake off. When it’s halfway done, you’re going to combine Maille mustard with some maple syrup and brown sugar, and brush it all over the top. 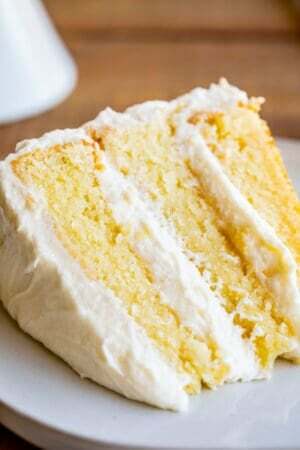 Continue baking until it’s irresistibly crispy and melts in your mouth. It’s sweet and tangy and a little bit spicy. The hardest part now is making sure that you don’t eat it all up before your eggs are ready. 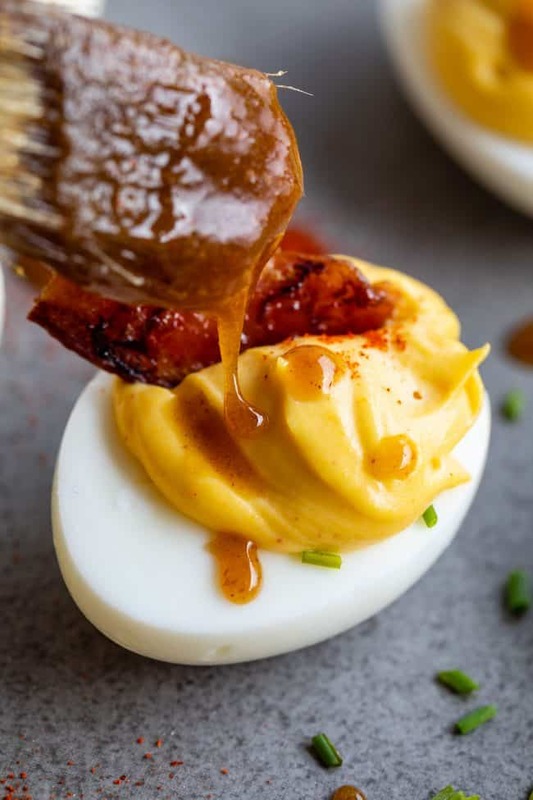 The best part about these deviled eggs with bacon comes at the end: Use some of the extra Maille mustard and maple syrup glaze that you used to candy the bacon, and drizzle it on top of the deviled eggs. The result is tangy, sweet, spicy perfection! I’ve never added any kind of glaze to the top of deviled eggs before, and now I don’t think I can ever go back. It. is. so. good. This would be a great recipe for Lent, because you can make it with or without the bacon depending on if it happens to be Friday. 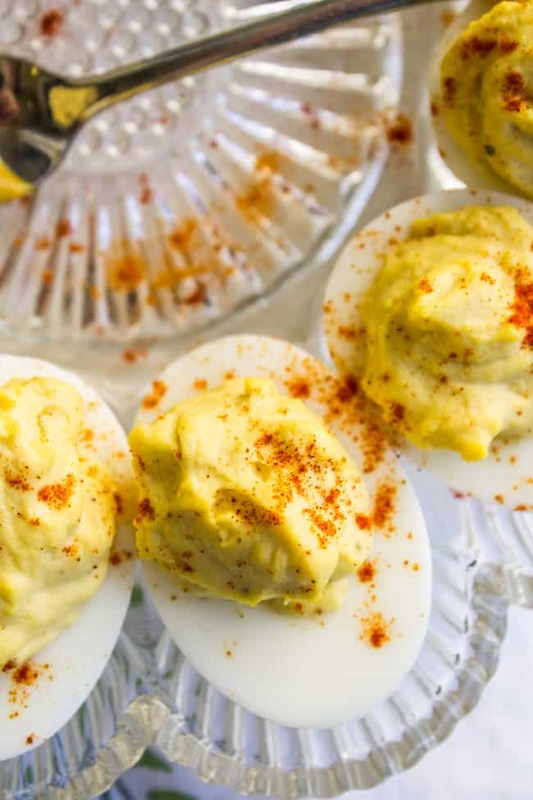 We all know deviled eggs are delicious by themselves! And it’s definitely a great idea for Easter Sunday. I seriously don’t know anyone who doesn’t get excited about deviled eggs. It seems like such a special occasion thing. (At least where I’m from. Although I’ve heard that deviled eggs are way more common as everyday fare in the South? Back me up my Mississippians and Alabamians.) I’m ready to get my South on. Deviled eggs erryday. There are deviled eggs...and then there are Dijon Deviled Eggs with Maple Candied Bacon! I mean come on. 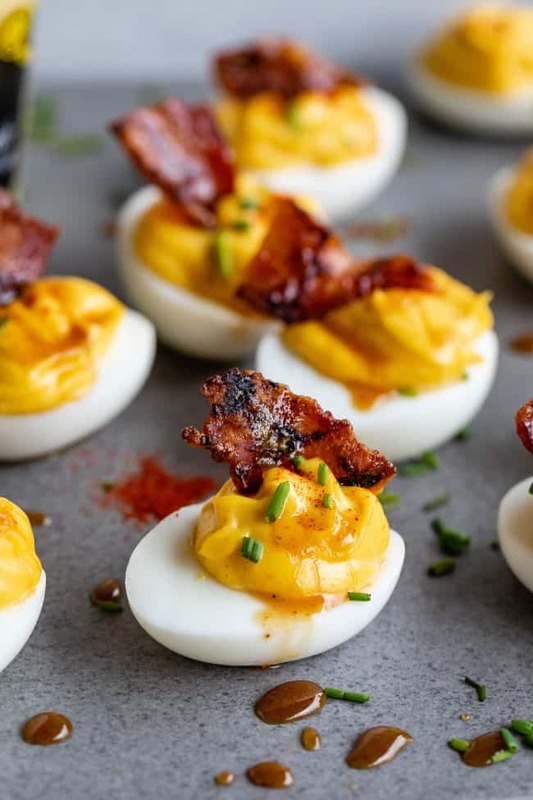 Deviled eggs are already everyone's favorite appetizer, and using dijon and adding candied bacon just puts it over the top. Plus I will teach you the best way to make hard boiled eggs that are never green and are SO easy to peel. Add about 2 inches of water to a pot that has a steam basket. Cover (without the steamer) and bring to a boil over high heat. Meanwhile, add 9 eggs to the steam basket. When the water is at a rolling boil, remove the lid and place over the steam basket, and place the covered basket over the boiling water. Keep the heat on high. Set a timer for 12 minutes right away. Meanwhile prepare an ice bath, or a large bowl with very cold tap water will work fine too. When the timer goes off, transfer the eggs to the cold water. I use a spoon to transfer them one a time but do it however you like. Let cool in the water for about 20 minutes. 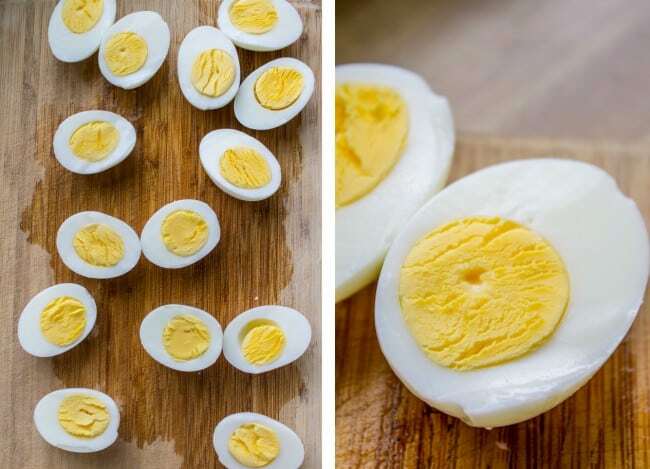 Peel the eggs and slice each one in half lengthwise. Scoop the yolks into a bowl or food processor. Place the whites on a serving platter. Crumble the yolks with a fork or pulse a couple times. Add the rest of the ingredients: mayonnaise, Maille Dijon Originale®, salt, smoked paprika, and cayenne pepper. Scoop the filling back into the egg whites. You can pipe it if you want, but I actually prefer the natural look of just spooning it in. At this point you can store covered in the fridge for up to 24 hours. Line a large baking sheet with aluminum foil. Set a large oven-safe cooling rack on top of the foil. Lay out your bacon slices in a single layer on the cooling rack. Try to fit them so they are not overlapping, but it's okay if there is some overlappage. The bacon will shrink as it cooks. Bake at 400 degrees for about 10 minutes. This will get rid of some of the initial bacon grease. 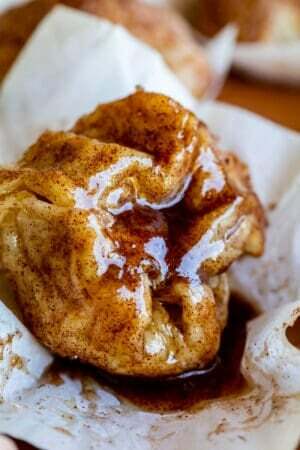 Meanwhile, in a small bowl, combine 3 tablespoons maple syrup, 3 tablespoons brown sugar, 1/2 tablespoon Maille Dijon Mustard, 1/2 teaspoon kosher salt, and cayenne pepper to taste. Remove the bacon from the oven and carefully brush about half of the maple dijon mixture over each bacon slice. Bake for another 10 minutes, then remove from the oven. 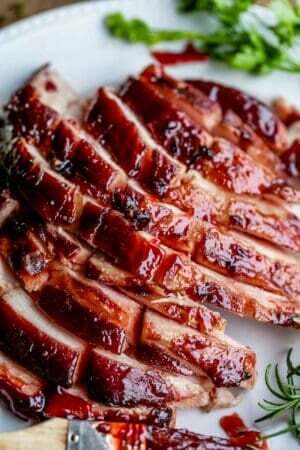 Flip over each slice of bacon, and arrange on the cooling rack so that they are not overlapping. Brush with most of the remaining maple dijon mixture, leaving about 2-3 tablespoons in the bowl for drizzling over the finished eggs. Return the bacon to the oven for another 5 minutes, or until they LOOK as crispy as you like them. At this point they will not be crispy, they will be quite flexible. They will crisp up as they cool. Keep an eye on them, because they go from perfect to burned very quickly (trust me I know!! Nothing sadder than burned bacon.) The total time in the oven should be about 20-30 minutes, depending on how thick your bacon is. Lay out a sheet of wax paper. Remove the bacon to the wax paper with tongs. They should be crispy within 5-10 minutes. Break or cut the bacon into 1-2 inch pieces Place 1 or two shards of bacon into the top of each deviled egg. Drizzle eggs with the remaining maple dijon glaze. 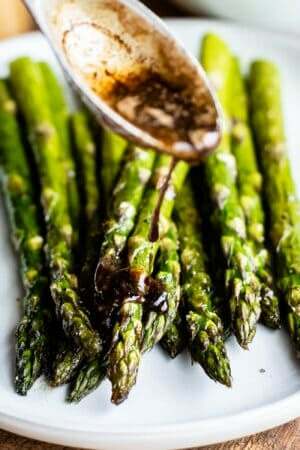 Sprinkle with chopped chives and a dash of smoked paprika. Don't eat all of them at once! *If you don't have a steam basket, boiling the regular way will work great! Add your eggs in a single layer to a pot. Cover with 2 inches cold water. Set over medium-high heat until the pot reaches a rolling boil. Once it is boiling nicely, turn off the heat, cover with a lid, and set a timer for 12 minutes. Continue with the ice bath step above. Classic Deviled Eggs << this is my favorite go-to deviled eggs when I want a simple, no fuss (but amazing) recipe. Classic Egg Salad Sandwich << Another killer no fuss recipe. 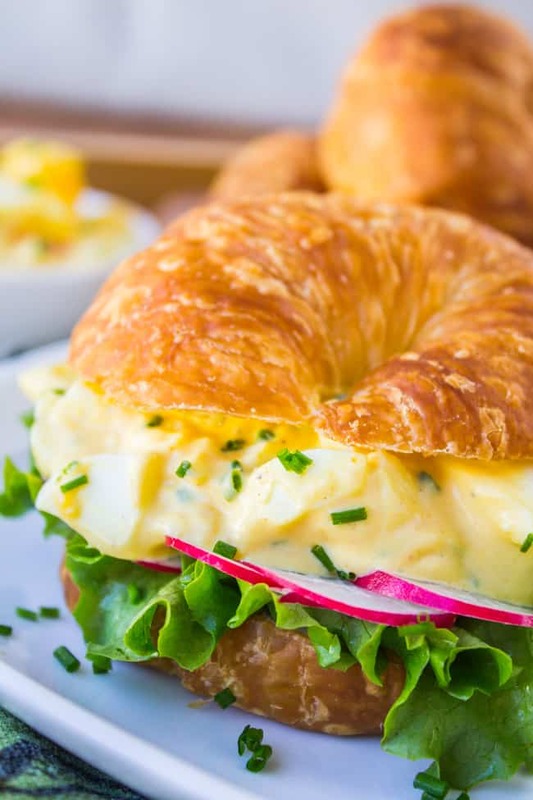 Who can say no to a good egg salad sandwich?? 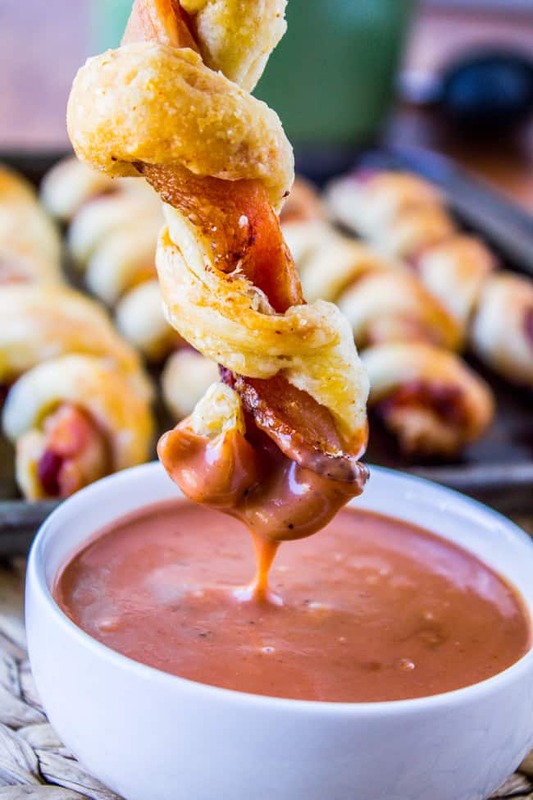 Puffy Bacon Twists with BBQ Ranch Sauce << bacon forever! 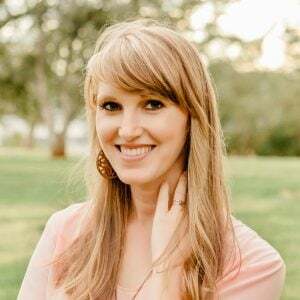 More deviled egg recipes from friends! I think I will make these for our friends Easter get together! The bacon will make Paul so happy! Yes do it!! Paul will love it!